Volcano bed and breakfast travel guide for romantic, historic and adventure b&b's. 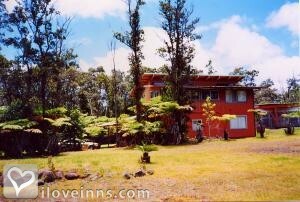 Browse through the iLoveInns.com database of Volcano, Hawaii bed and breakfasts and country inns to find detailed listings that include room rates, special deals and area activities. You can click on the 'check rates and availability' button to contact the innkeeper. Volcano, at the doorstep to Hawaii Volcanoes National Park (#1 State attraction) is your central location for touring all of East Hawaii. Spend several days in the Park exploring numerous craters, lava viewing and endless miles of scenic hiking trails. Volcano Village has much to offer - beautiful botanical gardens for an exquisite array of colorful orchids, exotic flowers and anthuriums; an 18 hole golf course; a local winery; art galleries; farmer's market on Sundays; gift shops; restaurants, just to list a few. A trip to the Eastern most point of the island takes you to Pahoa. Beyond Pahoa you can find spatter cones, tide pools, hot ponds, and lava trees while driving down one of the most beautiful roads on the island. Volcano was established in 1916 as a United States National Park. Volcano is on the island of Hawaii and shows the results of hundreds of years of the volcanism that made a land sprout from the sea and in it nature built a complex and unique ecosystem and the very distinct Hawaiian Polynesian culture that best describes the kind of welcome that one would feel after spending happy nights at any of the Volcano bed and breakfast facilities. Volcano has been designated as an International Biosphere Reserve in 1980 and a World Heritage Site in 1987. Some of the most interesting things to see in Volcano are the 1790 Footprints, the Wilkes campsite, the Whitney Seismograph Vault Number 29, the Puna-Ka'u Historic District, the Kilauea Crater, the Ainapo trail, and the Ainahoe Ranch. By Aloha Junction Bed & Breakfast.